If you don't have software like Microsoft Front Page and Adobe Photoshop for editing templates, you can use our online website builder for creating your site. With website builder you don't need any software. Just log in to your account through your browser, choose a template and create your site step by step. When your site is finished, just publish it on your server, or save it on your computer. You don't need any HTML skills. To use website builder first you need to purchase a premium membership. 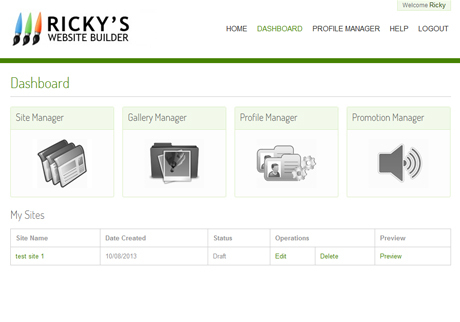 Then create a website builder account. IMcreator is a free website builder that offers many beautiful website templates and is very easy to use. Instant Site Building - User-friendly wizards for site building. No technical or programming skills are required. A powerful online help is available. Instant Site Modification - User-friendly wizards for site editing. Easy HTML WYSIWYG Editing - Easy operations as simple as using microsoft word! Your Own Logo & Image - Upload images directly into your content. Graphics Rich Templates - 260 templates included for editing. All these templates are included in the premium templates package. By becoming a premium member for only $29.95 you will have unlimited access to all templates and graphics on our site. Join Now !!! 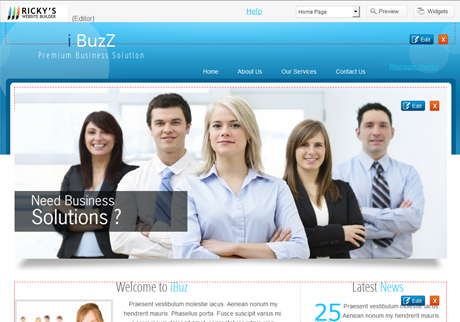 These templates are designed for website builder. For editing them you don't need any software. Just create a free website builder account and start editing templates step by step. You need to be a premium member to use the website builder.